"Meravigliosa magia dei libri, hai colpito ancora! Se volete dirlo con i fiori, beh... stavolta ditelo con un libro. Non ve ne pentirete." "...not just a `coffee-table' book but a useful tool for scholars." "If like me, you've been a lifelong lover of flowers, you will love to lose yourself in the pages of this beautiful book...this is quite simply one of the most beautiful flower books that we have ever seen... We love the tactile nature of this book. The weight, size and quality of the paper brings to life this wonderful collection of drawings, originally published between 1827 and 1833. 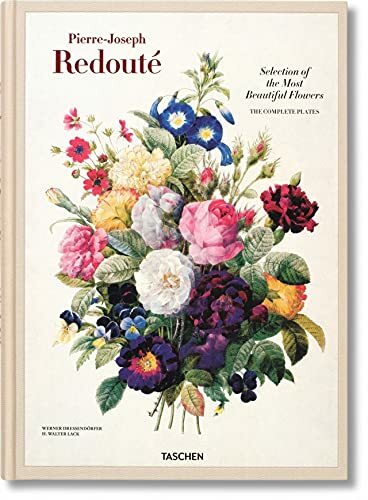 The pages reveal a quality, precision and appreciation of flowers that illustrate the love and passion of Redoute... Informative, delightful and beautifully presented, we'll keep a copy at the McQueens Flower school library to be enjoyed by our students from near and far - but I'll still have to have my own copy to cherish at home!" "...If you can't make it to the RHS Chelsea Flower Show, this is a brilliant alternative - minus the crowds." "...a gorgeous compendium work from TASCHEN. Detailing the rise of Redoute and flower painting in general, and the importance of botanical records for both science and personal prestige, it is a marvellous wander through the species that were flooding into Paris at the time, plucked both from nearby French meadows and far-flung hillsides in Greece, China and South America." Flower Power The finest work of the "Raphael of flowers" Pierre-Joseph Redouté (1759 –1840) was forever in high demand. Official court draftsman to Queen Marie-Antoinette (who purportedly summoned him at midnight to paint a cactus), and later a favorite of Joséphine Bonaparte, the artist brought flowers to the highest of places, and offset the chaotic upheaval of the French Revolution with the delicacy of perfectly drawn petals. This reprint brings together 144 examples of Redouté’s flower, branch, and fruit drawings. Originally published between 1827 and 1833, these precise yet tender illustrations are as delightful as they are informative, recording some of the most delicate plant specimens in the world and evoking the bygone magnificence of Parisian greenhouses and gardens. 2. Pierre-Joseph Redouté. Choix des plus belles fleurs. Gesamtausgabe der Stiche. Großformat-Ausgabe. Hg. W. Dressendörfer u. H. W. Lack. Köln 2015.